#203....."LEWIS COLLINS" - BODIE 3.7 . you'll never walk alone ! a more appropriate warning definitely....thankyou for your comment. Thankyou, yes he is definitely not camera shy ....i'm loving the casual pose agains the gate. So cool! (I hate using that word but it seems to fit!). Thankyou and i think cool more or less covers it. 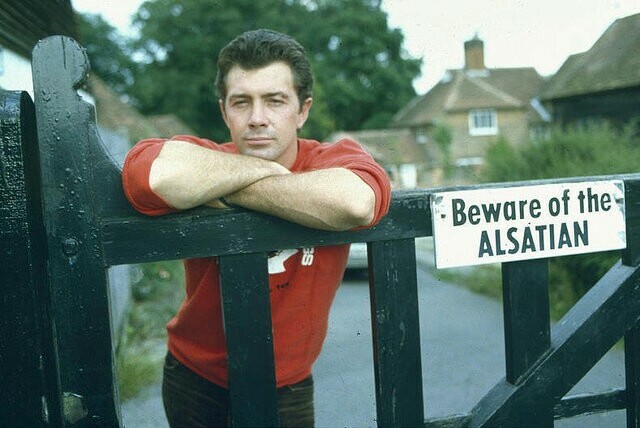 Beware of the Alsatian..and the gorgeous man just leaning there, lethally. *g* Thank you! defintely the warning that should be read ...gorgeous man leaning against the gate. The smile says so much :D Thank you! you are very welcome and he looks utterly gorgeous just casually leaning against the gate. Mmm, lovely. I wouldn't mess with either one of them. yes he is lovely and i know exactly what you mean, thankyou.